You know that insult, falling off the ugly tree and hitting every ugly branch on the way down? Well, this book fell off the cliche tree and hit every single over-done and beaten-to-death cliche on the way down and then it landed in plagiarism. Every cliche or trope in sci-fi/fantasy is present in all 500+ pages of this... I hesitate to call it a story. The page count may not seem like a lot, but when it's a story or a poor mash-up of several stories you've read before, the read seems to go on forever. A number of reviewers mentioned that the story is a combination of Star Wars and The Lord of the Rings. The setting is basic high fantasy. There is an attempt to create a varied world like that of Tolkien's; however the creatures, languages, and cultures are poorly done. The characters are so obviously the product of a teenage boy's mind; they're supposedly "grown-ups" who speak and behave like clueless children. The dialogues are so juvenile and awkward they made me wonder how this book ever became a movie. The "love story" is unintentionally hilarious; I saw a lot of Luke and Leia in the two love birds. (I know, I know. Ewww. But that's only because we know they're twins. Much later in the story.) And the overall writing is obviously that of a kid trying his hands at fantasy but ending up mimicking books and series he admired so much that it's practically plagiarism. Not long before I decided to read this book I saw a beautiful leather-bound box set of the Inheritance Cycle in a bookstore and thought maybe it'd be a nice gift for a young cousin who was just beginning to read chapter books. Looking back, maybe I should have gotten him the box set. It would have been his first epic fantasy adventure series, so maybe he would have enjoyed the adventure, seeing as how he'd never read epic fantasy before and wouldn't have recognized cliches or blatant plagiarism in the writing. His lack of fantasy knowledge and deconstruction skills might have let him enjoy Eragon for what it is, trivial rehashing of other well-known sci-fi/fantasy series. But I have this rule: never buy a book that you've never read for someone else, especially if that someone else is a child; only give books you think are amazing, especially to children. It took me about a month to get through Eragon, and by the time I was done, I was more than ready to burn it. I don't usually review books I can't stand, other than maybe to say why I can't stand it and why others might want to avoid it. Eragon is special though because everyone should avoid it. You're better off reading or watching the original works from which the book is lifted. There are countless other fantasy books and series that are more worthy of your time and effort. As a trend, I keep seeing reviewers refer to Twilight whenever they want to make a point about how terrible a book is, but I rarely see them making references to Eragon, this equally terrible waste of paper. I'm not making excuses for Twilight, of course; it's terrible in its own rights, but at least it's a terrible original text (of terrible origins). 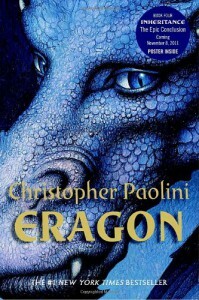 Eragon is a terrible copy; a cheap knockoff, as I already said, which is arguably worse than a terrible original idea. And yet, whenever book reviews compare books of equal terrible-ness, many of them leave Eragon out of the mix. So maybe as a reminder, next time you want to point out how terrible a book is, remember to include Eragon.